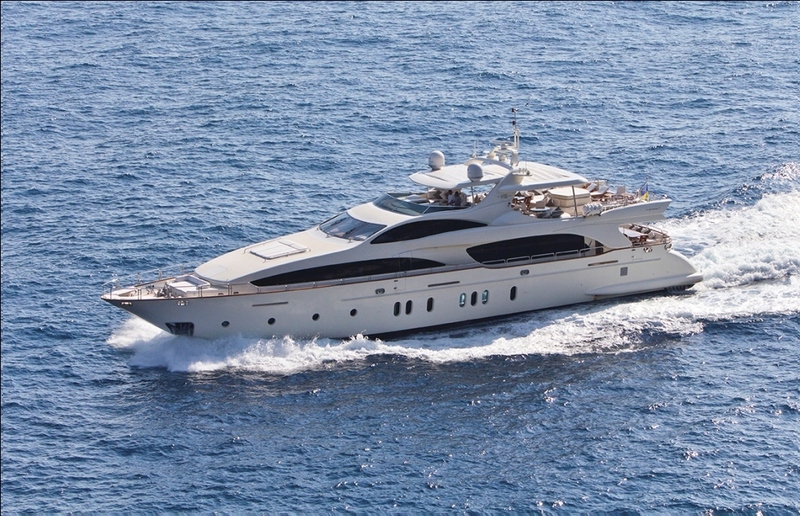 Motor yacht GRANDE was launched in 2012 by the well renowned Azimut shipyard and measures 35.3m (116ft) in length. 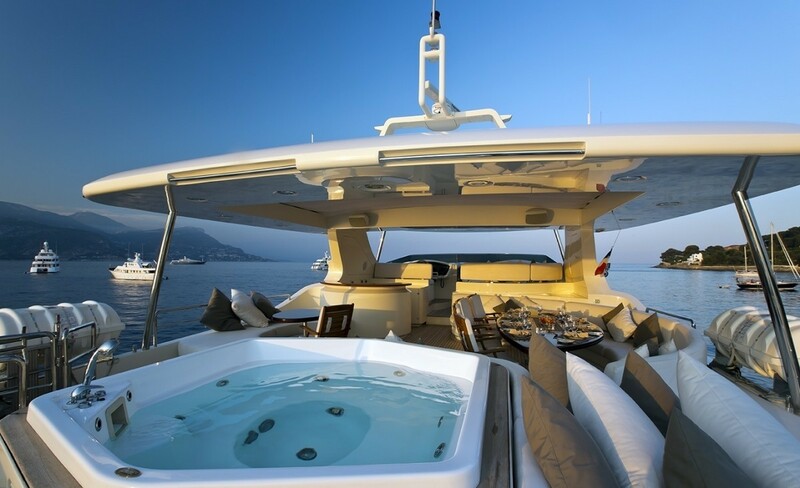 Boasting a sleek hull design, ample exterior living and a luxurious interior décor, the GRANDE motor yacht offers deluxe accommodation, for up to 10 charter guests, in 5 en-suite cabins. 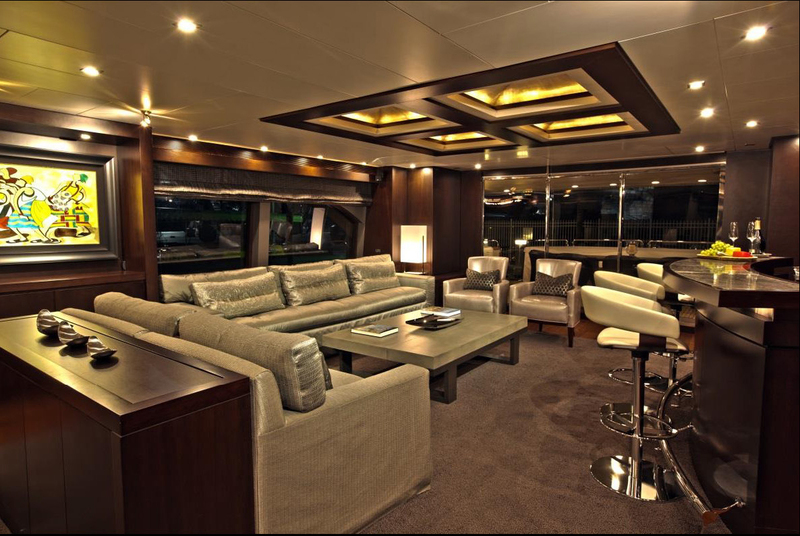 Crewed charter yacht GRANDE features a modern and chic décor of cooling neutral silver tones, creating a soothing ambiance throughout. 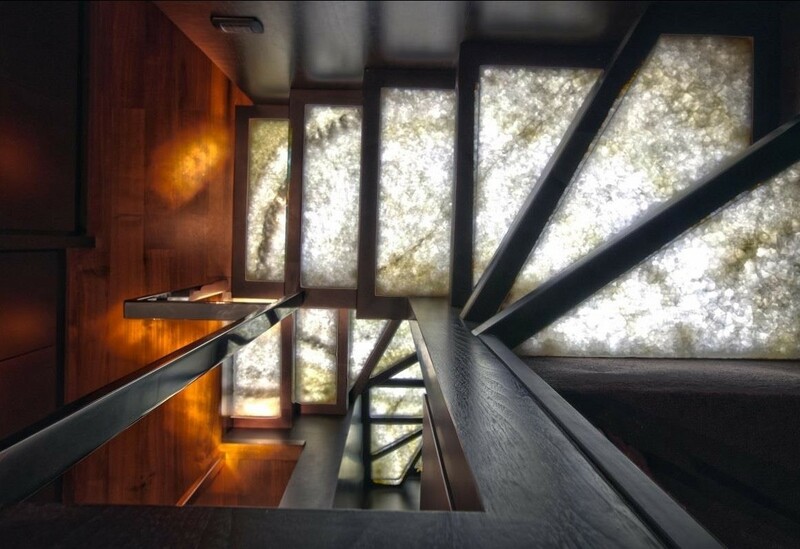 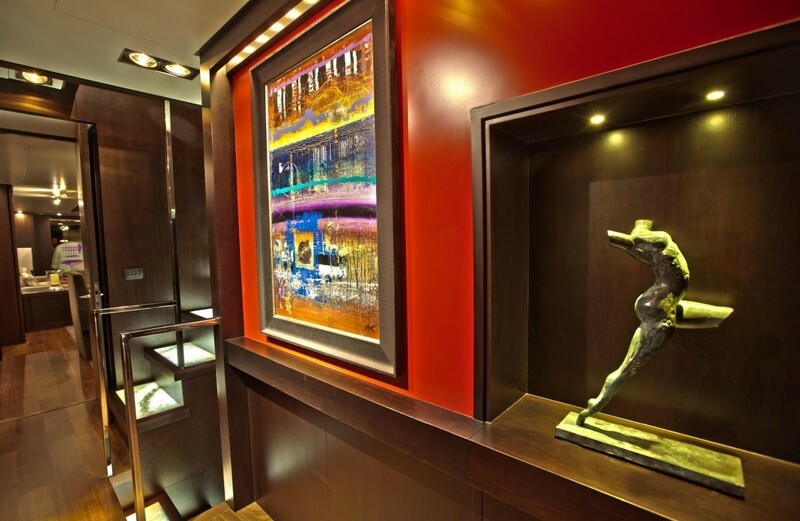 Bespoke and distinctive art brings an element of individuality and allure to the interior spaces. 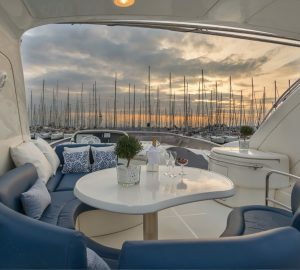 The salon and dining is an open plan and boasts a generous lounge with ample seating, full entertainment systems and complete wet bar aft. 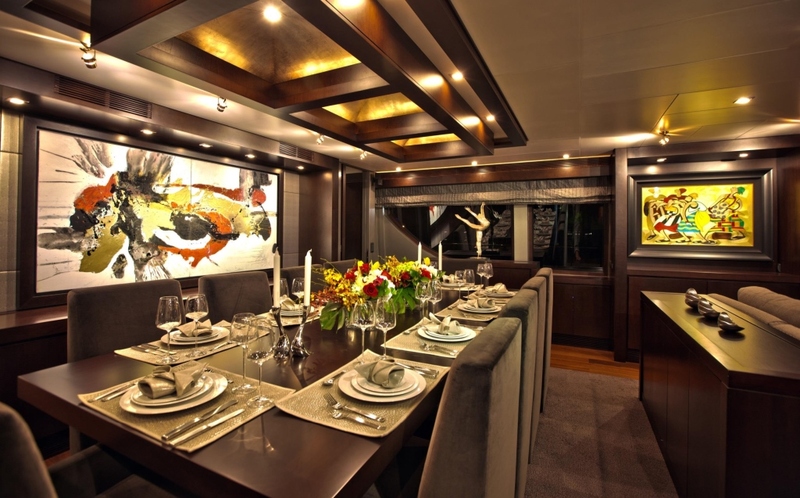 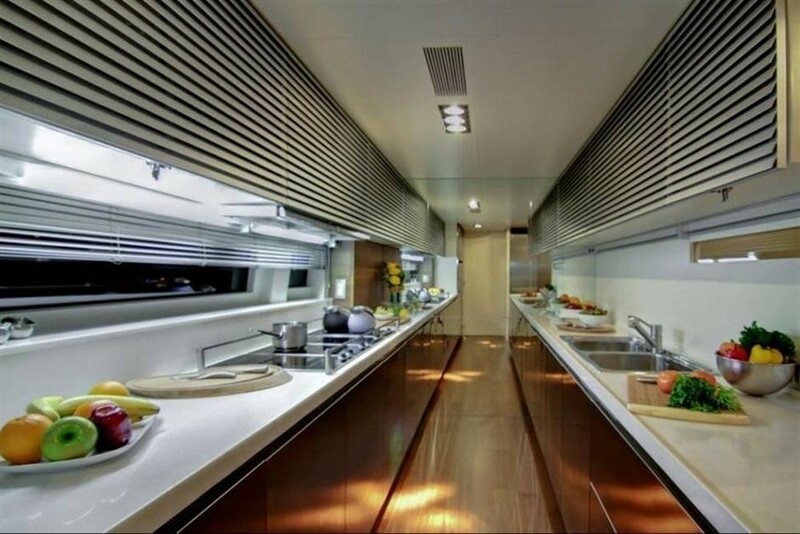 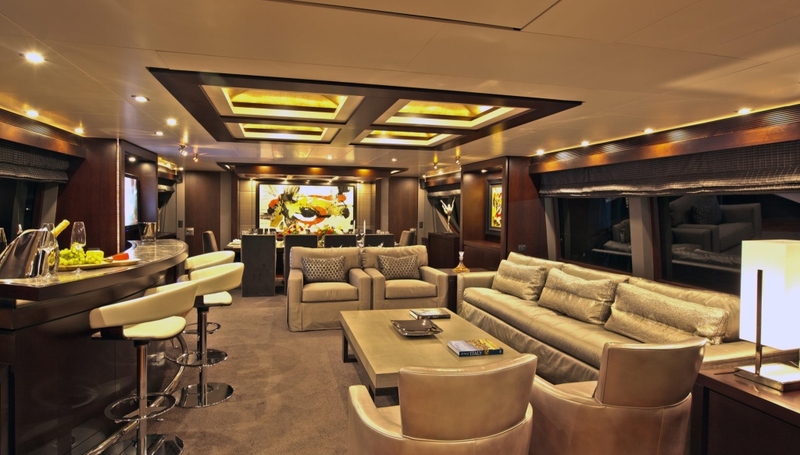 The formal dining area is forward and full beam of the yacht, seating all guests with ease. 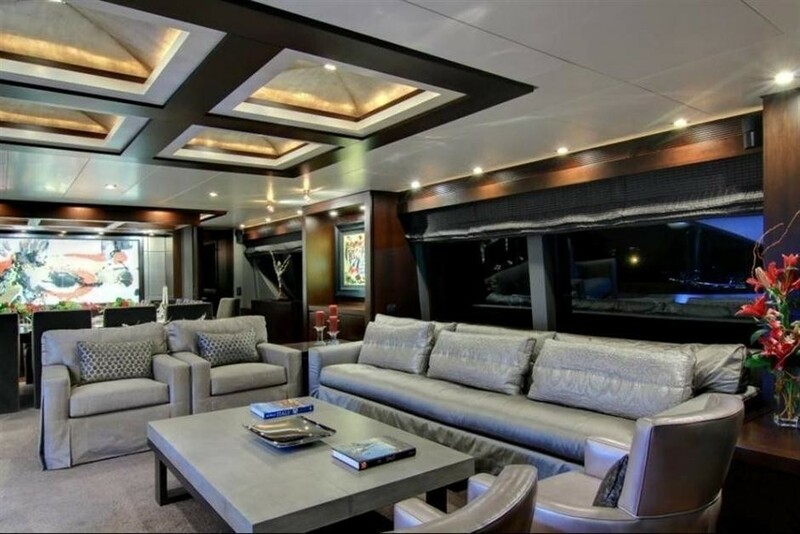 Large scenic windows provide stunning views and allow for ample natural light. 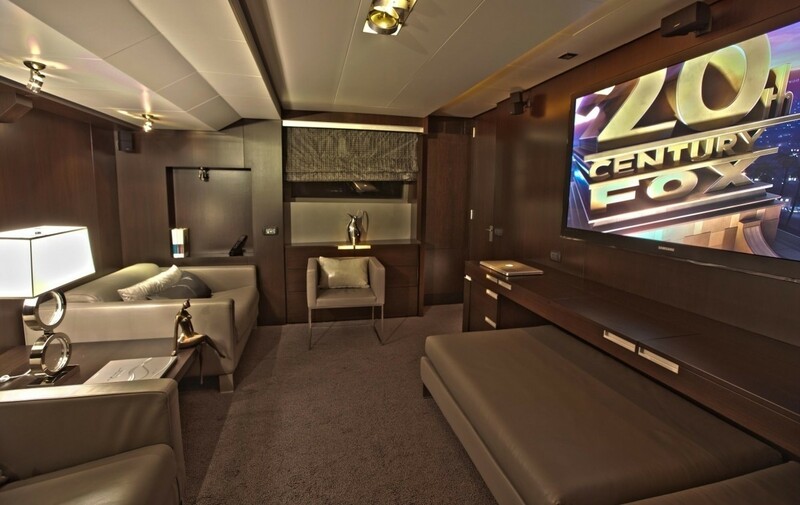 On the main deck forward of the salon and galley, is a state of the art media room, perfect for movies or catching up on the latest sports. 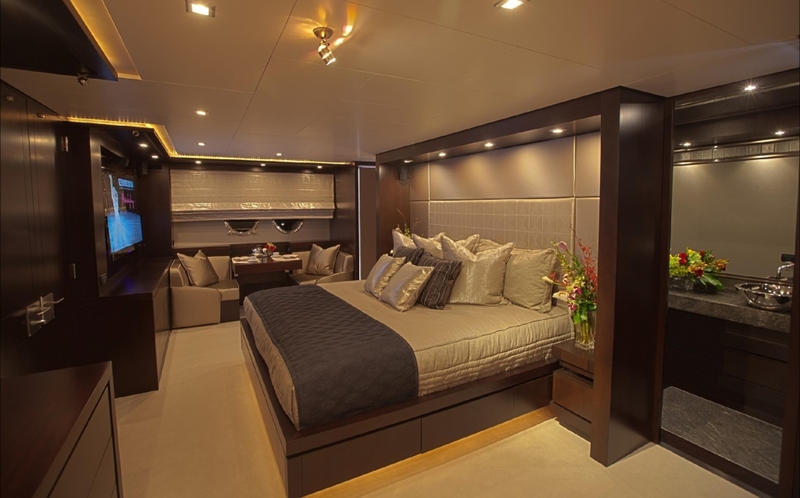 Below decks are 5 well-appointed and relaxing guest cabins, each with private en-suites. 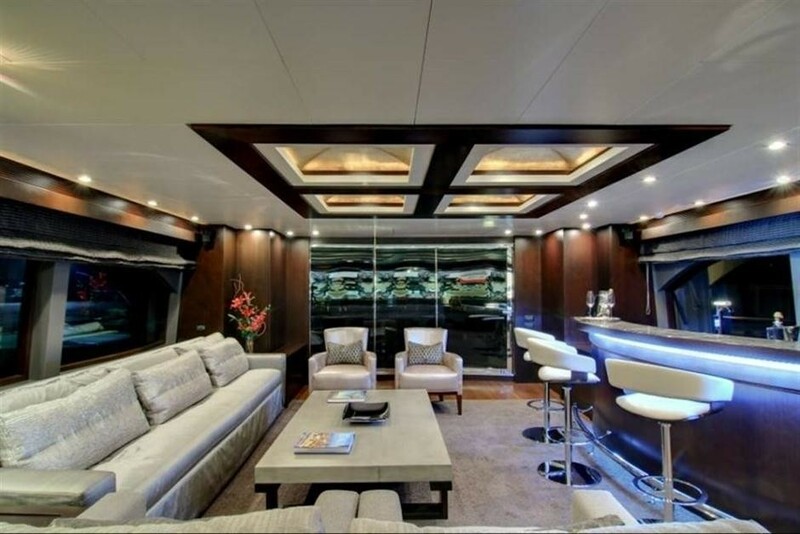 Exterior living on the luxury Azimut 116 GRANDE is plentiful on 2 spacious decks. 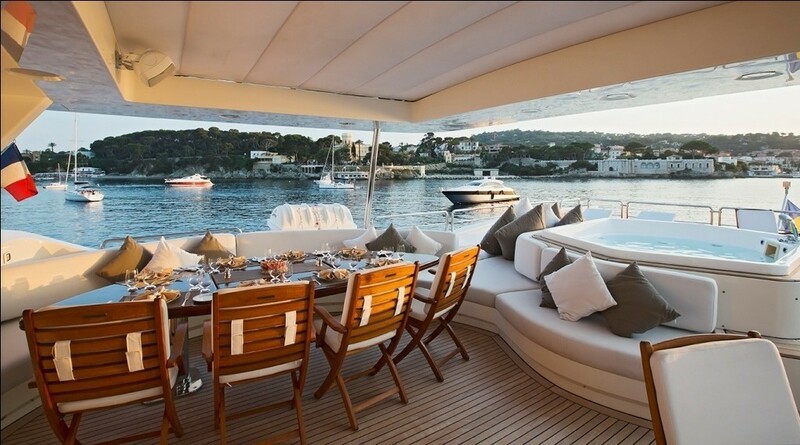 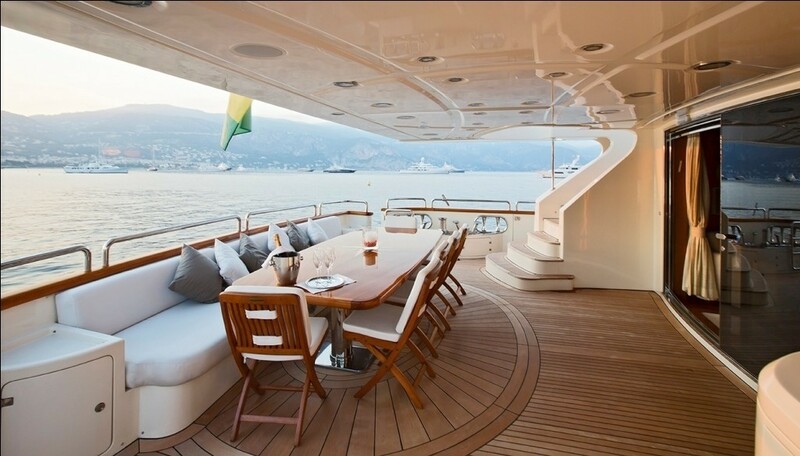 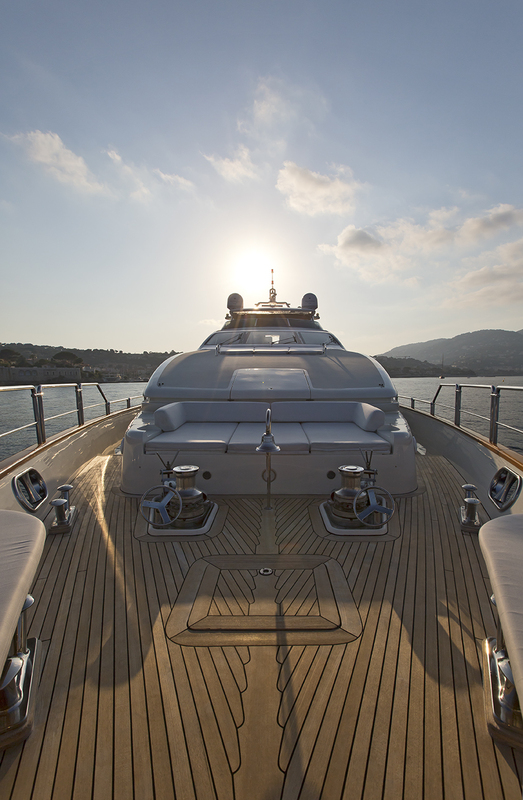 The main deck wraps around the yacht, offering a shaded aft deck, with alfresco dining option and seating. 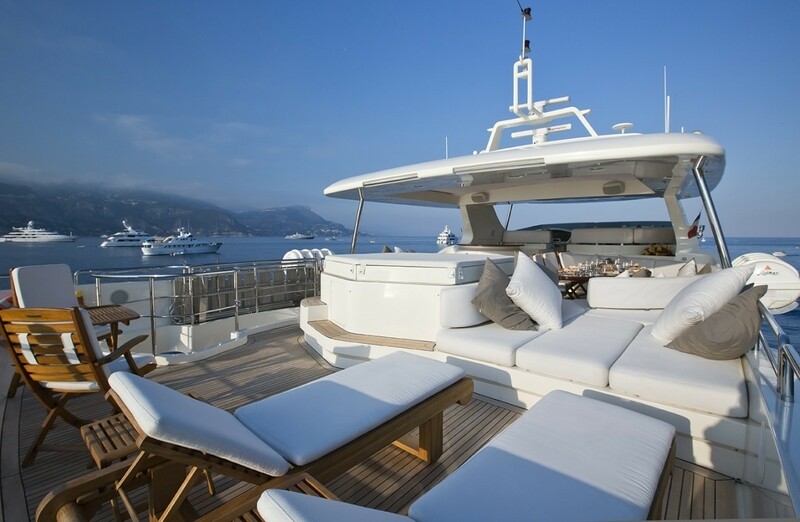 Forward is a large seating area and triple sunpad, perfect for the sunlovers and stargazers. 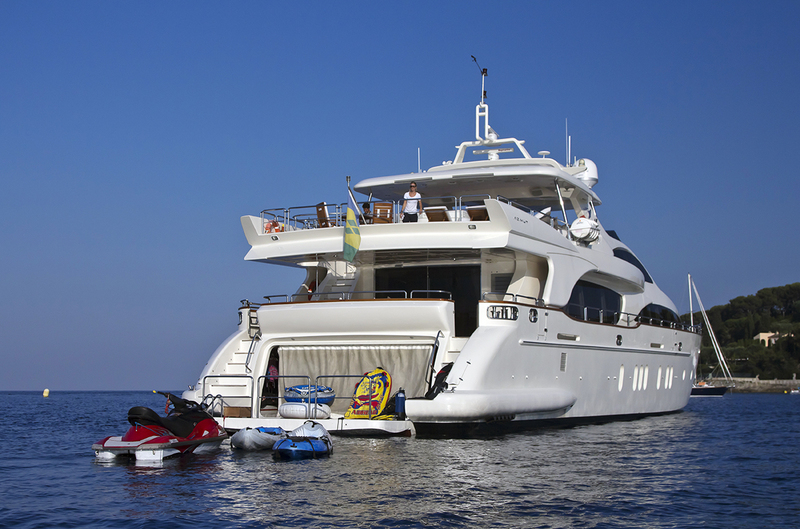 The transom of the charter yacht GRANDE, boasts an extended swim platform and large water toys garage, ideal for effortlessly making the most of the water toy selection on board. An upper sundeck is a fabulous social venue, featuring an alfresco dining table, wet bar, BBQ Grill, relaxing Jacuzzi tub, sunpads, chaise lounges and retractable roof offering partial shade. 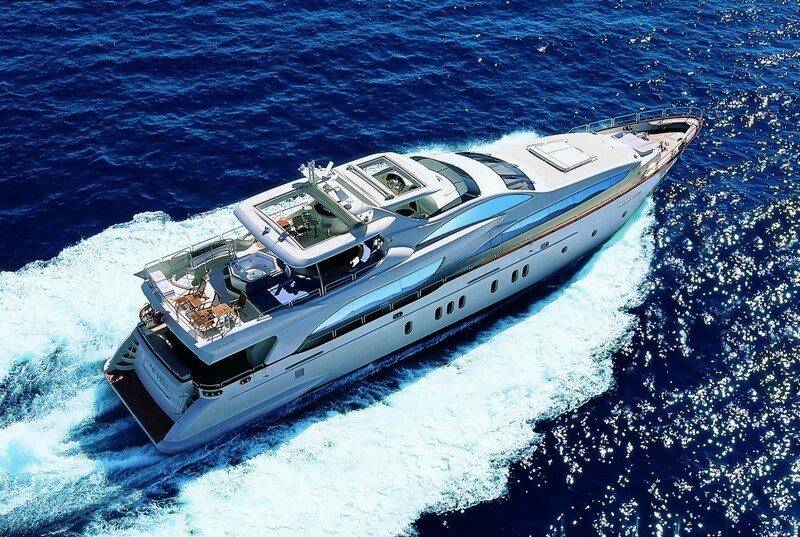 M/Y GRANDE is powered by 2 MTU 2000hp engines, capable of cruising at 21 knots and reaching top speeds of 28 knots. Luxury charter yacht GRANDE offers accommodation in 5 deluxe and stylish cabins, for up to 10 guests on the lower deck. 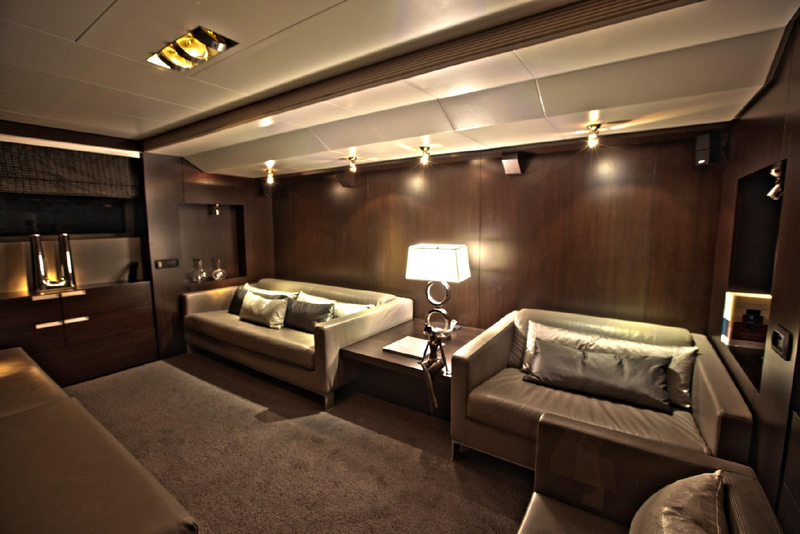 The media room on the main deck forward, can also covert to form a twin or king size cabin as an additional option. 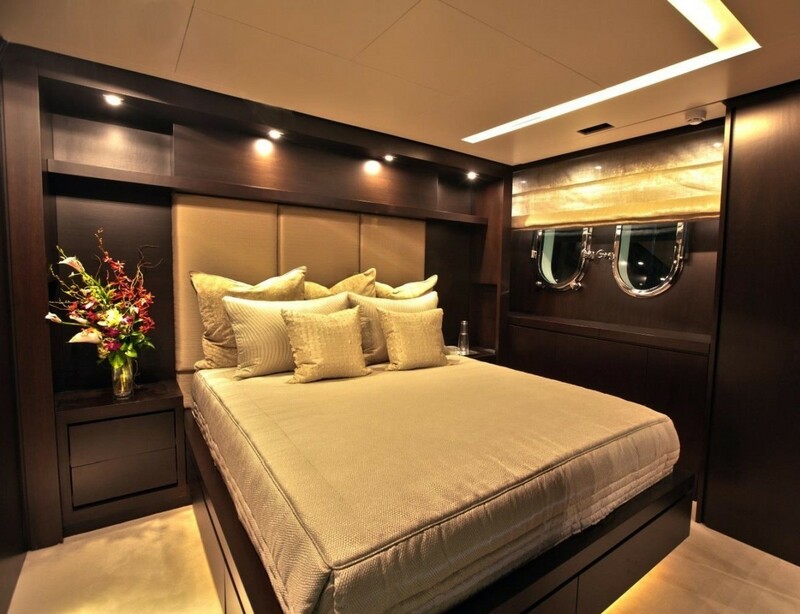 The master stateroom is amidships and full beam of the yacht, with a king size bed, seating area and vanity. 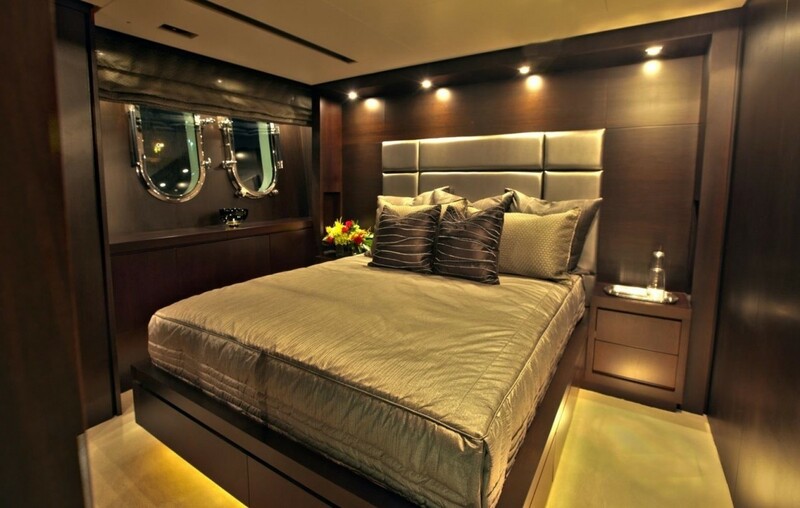 Two mirror image VIP cabin on port and starboard both offer walk around queen size beds. A further 2 guest cabins each have side by side twin beds. 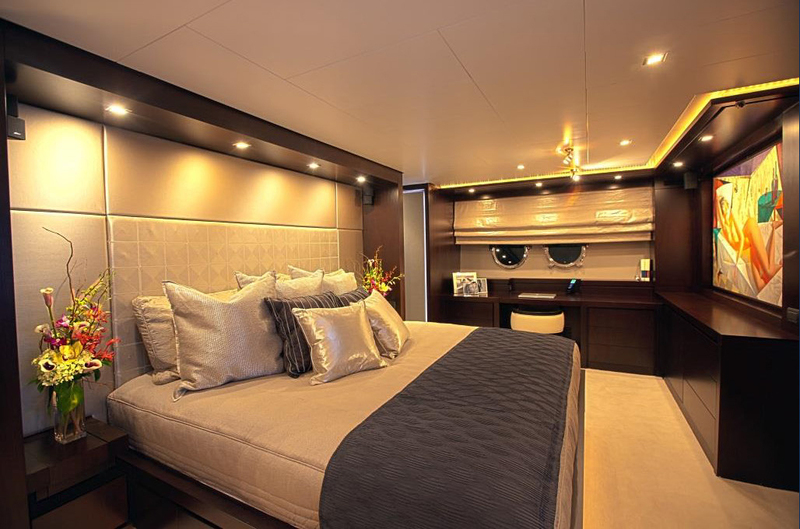 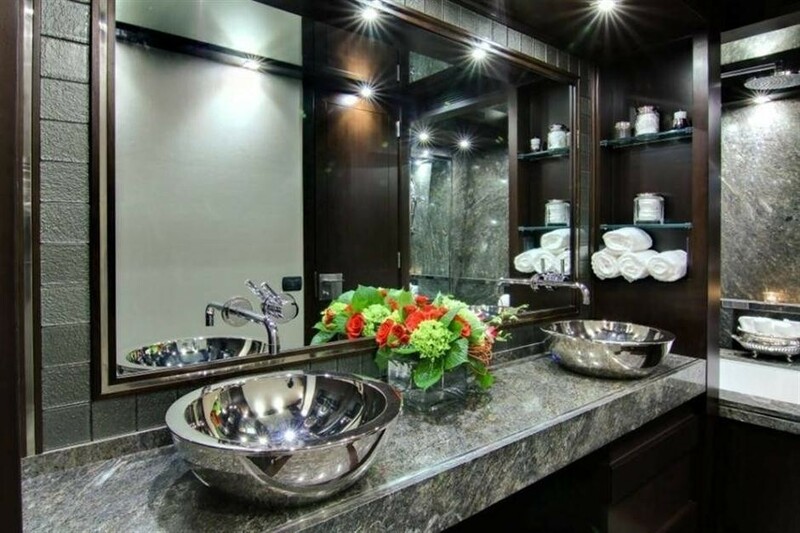 All the guest cabins aboard the M/Y GRANDE are fully air conditioned and provide private en-suite facilities.